2019. is at its beginning. However, many tech events were planned the year ahead and already scheduled for this year. 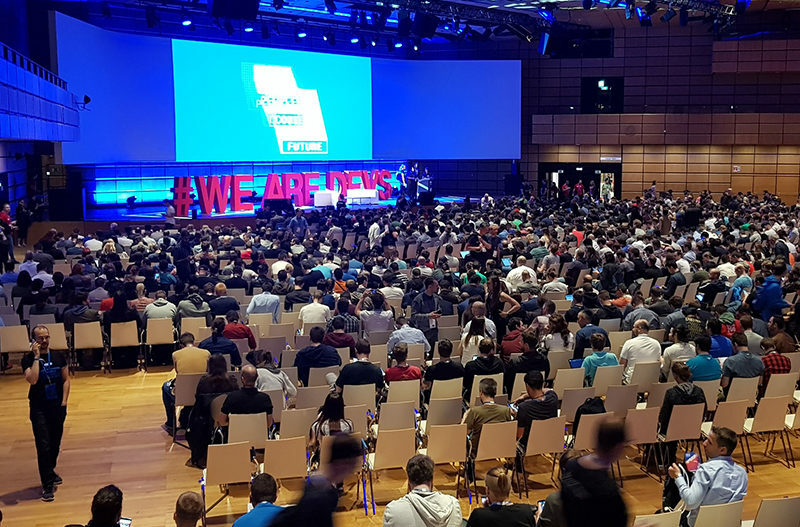 There is still ongoing debate if tech events are worth the money and the time, and that question makes our search for the perfect event to attend even harder. Still, if you’ve decided to participate in a tech conference no matter what, you should use the opportunity as much as you can. Don’t forget to network, and check out our advice on that topic if you’re unsure how to do it. In today’s article, we will present you with the most anticipated tech conferences of 2019. Scheduled for the end of March this conference will offer you all you need to know about the cloud ecosystem. During the whole week, you will be able to learn about new technology and internet innovations regarding the cloud ecosystem. If your product covers this topic, or you’re the hungry-for-knowledge enthusiast than you should definitely check this conference out. One of the most anticipated tech conferences of 2019. is for sure The Next Web. The reason for this claim hides in the fact that TNW is designed to give you a unique opportunity to showcase your business. Besides offering the chance to meet potential investors, TNW brings together like-minded people eager to raise the bar when we talk about technological advancement. What’s more, there is one of a kind offer for Serbian IT industry to exhibit on TNW this year. Check it out by following this link. Scheduled for Mid-April, Industry Europe takes place in Dublin. It offers a fantastic insight into how different tech companies manage product in different environments. We love it because of its unique capability to bring together big companies and small startups, and it focuses on transmitting valuable knowledge. You will be able to hear amazing speeches from renewed leaders in the tech industry and to showcase your services as well. Fourth on the list when it comes to the most anticipated tech conferences is definitely a Blockchain West conference. It brings up the ones interested in the blockchain technology and the ones experienced in it and eager to share their knowledge. It’s most certainly the best place to meet enterprise firms actively seeking Blockchain platforms, products, and services. You guess, but we also have the fantastic offer to this event, and you can check it out by following this link. Fifth among the most anticipated tech conferences this year is TECHSPO Technology Expo. It’s the right fit for the ones ready (and able) to spend some extra money on traveling to the USA. But it is worth the money invested! TECHSPO Technology Expo is one of the leading IT conferences in the United States, and it gives you insight into the newest developments in the field of innovation and technology. IoT, virtual reality, augmented reality, 3D printing… you name it, they have it! If you missed the chance to apply to this event, it might not still be late! Check our offer ASAP. Scheduled for the end of February this conference is all about technological advancement. Use the unique opportunity to discover the startup technology that will be making a difference 4 years from now. 4YFN and Mobile World Congress are definitely one of the most anticipated tech conferences year after year. But if you think it is going to be tight, don’t wait four years from now, but book 2020 event on time! DMEXCO is the place and for key stakeholders in digital, marketing, and innovation event bringing industry leaders, marketing and media professionals, and tech pioneers under one roof. Both globally and locally focused companies, entrepreneurs, and investors, are involved in the DMEXCO ecosystem filled with seminars, debates, and expositions outlining the future of the digital economy and driving market value. Connecting over 41,000 visitors, thousand exhibitors, and more than 550 speakers from all over the world, this event sets the standard as the place for business minds to learn and inspire, build connections, and for ideas to become actions. We believe it is clear why this event is one of the most anticipated tech conferences in the world. Check our DMEXCO offer here! We get it, when you’re in charge of the small startup, it’s always hard to make a marketing budget. However, when you decide to do it and finally showcase to the world what you can do, you won’t regret the money spent. We promise! It’s not always about the instant results you can see. There is much more about building connections with potential hires, investors or partners who are ready to take your business to the next level. Did we forget to mention an important event? Or if you have an idea about which event would be exciting to attend. Then give us a shout.